id like to thank everyone for there help i finally got the trooper going just ended up replacing the ignition. i took the old one apart and all the copper contact plates and pins were corroded so i replaced it and it fired right up. always the little things that get you and frustrate you the most. well i have it narrowed down to my fuel pump and rad fan that are keeping me from enjoying my trooper, when i turn the ignition all the way over to where the fan and pump are suppose to kick in they do not, but sometime will. i ended up running a direct line to the fan and fuel pump and they are working but it still will not fire. i took off the fuel rail system to see if the injectors were giving fuel but they were not. so is it something to do with the computer? i replaced all the relays too just to make sure but still no go. is it because the computer isnt sending a single to the injectors to give fuel? im not a mech but i am getting frustrated cause no one around here knows anything about these things. and everything i know is off of this forum witch has helped me with so many problems that i have fixed. i am hoping to be helped again. is there a way to wire it to make the computer send a signal to the injectors to give fuel? if that is even how it works? thx for the info ill be doing that in the next couple days. took my t2 for a drive today and let me tell you i sure am glad i went with a joyner, it is big and heavy but thats okay couldnt get it stuck in any amounts of snow i went through. cant wait for it to melt so i can see what it can do on hills and in some mud. 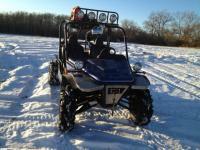 i love the 5 speed manual sure is nice to acualy drive a utv and be in control of it. first mod im going to do to mine is buy a couple pellican cases and mount my fuse boxes inside them to make them water proof so i will never have a shorting issue with water since there is always alot of water and river/creek crossings on our trails up here. yah i think i will hold up on the super charger this season and just ride it as is and get a good feel for it and make minor mods to it and maybe this winter if i am not happy with the power install a super charger. thx for the heads up on the eletrical i will go through it with a fine tooth comb and try and make it as water tight as i can since there is alot of creek and river crossings up here. thx for the heads up rocmoc looking at the pics he has sent me on it it already has been snorkeled between the two seats about head level. thx for the heads up kinarfi. any thing else i should be looking for on it when i go look at it and take it for a drive? West rockies in alberta, i didnt think it is to expensive everything up here is over priced compared to the states, you guys are lucky. Iv been looking around for a side by side for a decent price, and i came across a trooper t2 and was in awe how sweetit looked and the price on it. It is impossible to find a turbo or supercharged side by side for under $17000 up here. Another thing the pulls me towards a trooper t2 is the car engine i feel like it would last way longer then a v-twin and im looking for something to last me a while. But back to my question about the supercharger kit,anyone know when it will be availible? Hey guys im new to the joyner world i acualy just found out about them a couple weeks ago, im buying a 2008 trooper t2 in a week and iv been doing alot of research on them and they seem amazing exept for the minor flaws and some major ones but it doesnt matter what you buy there will always be a leamon in every brand. the guy said he fixed all the flaws that he has had with his so im hoping that is the case cause i will be waiting for one of the super charger kits to be avalible. iv been reading lots of the turbos and super chargers and i feel like the super charger will be more sutible for me. i live in the rockies and there is alot of hills to climb.do you guys have an idea on the price the kit will be? im paying $7000 for the joyner so even if its under $4000 it will still be less then buying a used rzr 800 there going for at least $12000 up here. Thats what appeals to me the most is the affordability of these machines.